This may be the coolest restaurant on earth. This morning I had green pepper cheese grits with eggs over easy and fried potatoes. It wasn’t the healthiest meal I’ve ever eaten, but it was worth it—pure culinary heaven. My two sons, Luke and Sean, and my wife, Harriet, had “Tim’s Favorite,” pancakes with blueberries and bananas. They loved it. “Tim’s Favorite” is named after the owner of the restaurant, Tim. He’s a friendly guy, attentive and available to his customers, and genuinely concerned that you have a great experience at his restaurant, Tim’s Place, in Albuquerque, New Mexico. Tim’s Place opened three-and-a-half years ago. At first business was slow, but over time news began to spread by word of mouth. It bills itself as “The World’s Friendliest Restaurant,” and that may well be why business has picked up so much. During our visit, the place was full of happy, satisfied customers. The wait staff, manager, Tim himself, and even Tim’s mom were all extremely friendly and attentive. Of course, every restaurant owner wants friendly staff, and some are more successful than others in this regard. The attitude at Tim’s place, though, wasn’t the kind of manufactured friendliness we’ve come to expect in restaurants. One gets the sense that the folks who work there want to be there, and they realize that they are working for a cause more important than a paycheck. They are doing more than serving up plates of cheese grits and pancakes. They are serving other people by helping this young man achieve his dream, and by challenging myths and misunderstandings about people with Down Syndrome. That, by itself, is enough reason to eat there. But man, those green pepper cheese grits were good. August 2, 2014 in disability, Down Syndrome. David Watson!! You are here in New Mexico?? Beautiful country isn’t it? I live three blocks from Tim’s and yes, great hugs, warm and welcoming and that green chili can’t be had anywhere but here in NM! 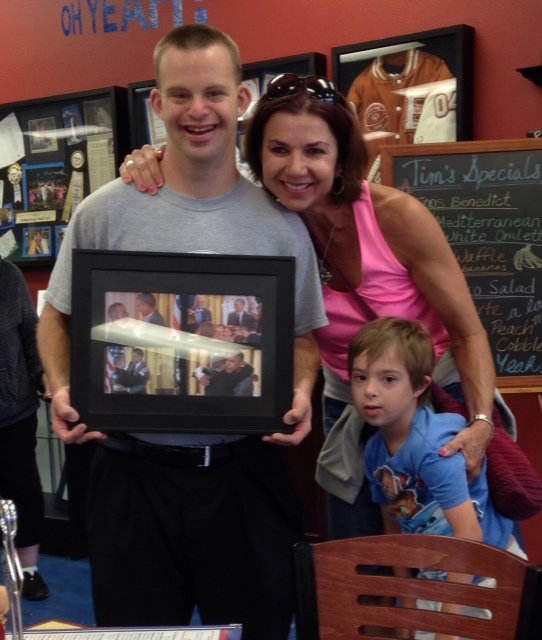 So glad you got to experience Tim’s great place! I’d be happy to host some coffee here at the house or somewhere convenient. If you are still in Albuquerque for worship tomorrow, welcome to University Heights UMC on Silver just one block south of Central at Yale. Service at 10:15 am! You were my NT II professor last summer! Graduate class of 2014! Tim’s Place sounds like a big slice of heaven on earth. I love how Tim does his “happy dance” on the way to work! We’ll definitely have to visit next time we’re in Albuquerque to see our family. Thank you so much for sharing. Sure is. I hope you get a chance to check it out. Nic has been to Albuquerque numerous times to minister but I have never been to Albuquerque. Now I have a reason!